The MW 7.0, 12 January 2010, Haiti earthquake triggered more than 7,000 landslides in the mountainous terrain south of Port-au-Prince over an area that extends approximately 50 km to the east and west from the epicenter and to the southern coast. Most of the triggered landslides were rock and soil slides from 25°–65° slopes within heavily fractured limestone and deeply weathered basalt and basaltic breccia. Landslide volumes ranged from tens of cubic meters to several thousand cubic meters. Rock slides in limestone typically were 2–5 m thick; slides within soils and weathered basalt typically were less than 1 m thick. Twenty to thirty larger landslides having volumes greater than 10,000 m3 were triggered by the earthquake; these included block slides and rotational slumps in limestone bedrock. Only a few landslides larger than 5,000 m3 occurred in the weathered basalt. 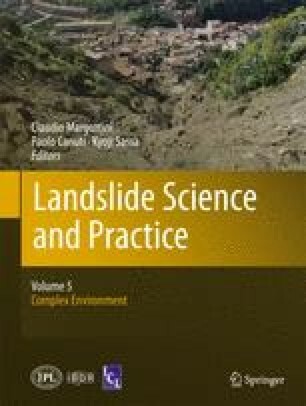 The distribution of landslides is asymmetric with respect to the fault source and epicenter. Relatively few landslides were triggered north of the fault source on the hanging wall. The densest landslide concentrations lie south of the fault source and the Enriquillo-Plantain-Garden fault zone on the footwall. Numerous landslides also occurred along the south coast west of Jacmél. This asymmetric distribution of landsliding with respect to the fault source is unusual given the modeled displacement of the fault source as mainly thrust motion to the south on a plane dipping to the north at approximately 55°; landslide concentrations in other documented thrust earthquakes generally have been greatest on the hanging wall. This apparent inconsistency of the landslide distribution with respect to the fault model remains poorly understood given the lack of any strong-motion instruments within Haiti during the earthquake.